Tucker Wins – You Win C-TEC2 Oil! Every Pro Open final Tucker wins this season, six people will win an autographed pouch of C-TEC2 Synthetic Oil. Sign up once and you are entered to win for the entire season – it’s that easy! Your odds are good – last season 128 people won free oil! One of the newest and most advanced 2-stroke snowmobile oils in the industry, C-TEC2 was specifically-developed over a three-year period to meet the unique lubrication needs of the groundbreaking Arctic Cat 600 C-TEC2 engine. C-TEC2 has superior cold flow properties and offers the highest level of engine protection. While engineered for use in the C-TEC2 engine, C-TEC2 oil is up to meeting the challenge of racing as well as trail use in all Arctic Cat 2-stroke snowmobiles. 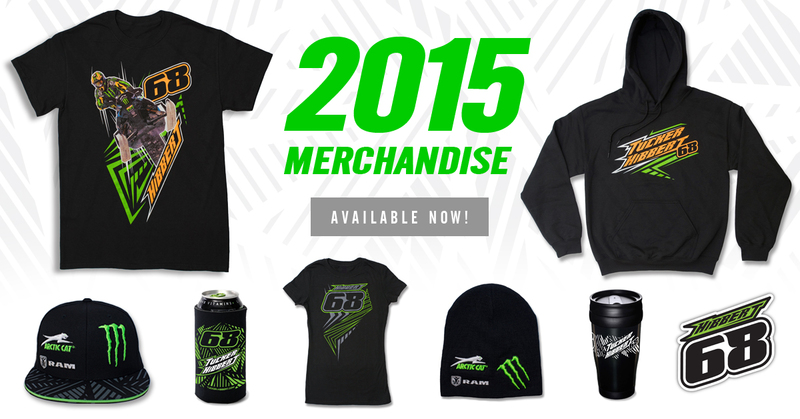 Tucker Hibbert’s 2015 official merchandise is now available! With over 20 uniquely branded items, Hibbert’s merchandise line has clothing and accessories for every Team 68 fan. Hibbert’s official merchandise line is available exclusively through his online store and trackside at every stop of the ISOC National Snocross tour. His online store features same-day shipping to customers in the US, Canada, Denmark, Finland, Iceland, Norway, Sweden and the United Kingdom. On-Site: Tucker Hibbert’s official merchandise booth will be trackside at every ISOC National Snocross event of the 14/15 season. The All-New Tucker Hibbert Signature Collection of hats, shirts and hoodies is available now from Arctic Cat, offering fresh styles that are inspired and designed by the all-time winningest snocross champion. The fifteen premium items include an assortment of knitwear, caps, shirts and hoodies for men, women and youth, all adorned with the iconic No. 68 made famous by the legendary Team Arctic racer. The Tucker Hibbert Siganture Collection from Arctic Cat can be purchased online or through Arctic Cat dealers worldwide. Tucker Hibbert will enter his 15th professional snocross season with a proven program focused on success. With the same core crew members and a familiar sponsor line-up behind him, Hibbert is in a solid position to defend his ISOC National Pro Open title, continue his X Games Aspen gold medal streak and claim his 100th Pro National victory. 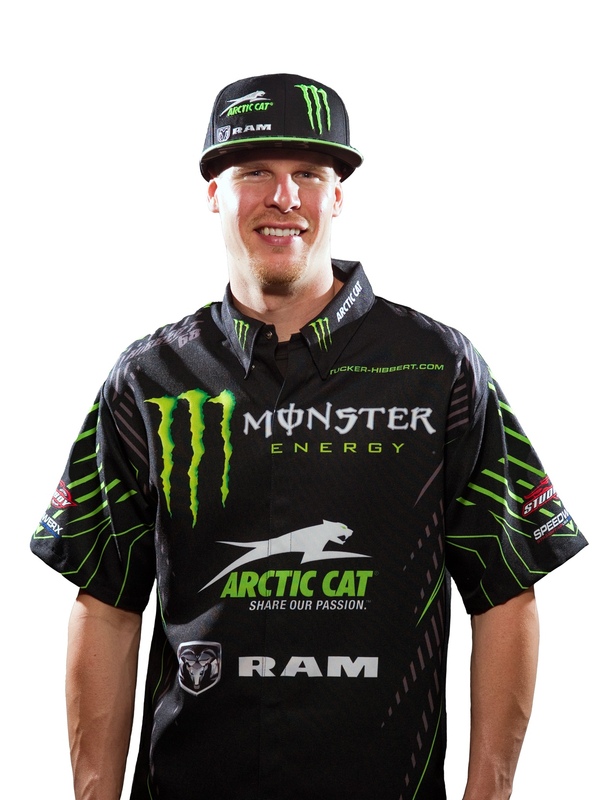 For the 2014-2015 season, Hibbert will compete under the Team Monster Energy / Arctic Cat / Ram Truck banner. Monster Energy will continue to lead the program as the title sponsor with Arctic Cat providing factory support with its potent 2015 ZR 6000R SX. In addition to returning as the official truck of Hibbert and his crew, Ram Truck will be added to the team name. As earlier announced, Hibbert is back with the race gear brand he began his professional career with – Arcticwear by Arctic Cat. Long-standing sponsors completing Hibbert’s program include: Stud Boy Traction, FLY Racing, Speedwerx, FOX, Leatt, Hot Stuff Pizza, C-TEC2 Oil, TekVest, SPY Optic, Kicker Audio, Digital Ink Design & Graphics and CTi. Hibbert will begin his 2014-2015 snocross campaign Thanksgiving weekend at the ISOC Duluth National in Duluth, Minn. For more information on Hibbert, his schedule and Team Monster Energy / Arctic Cat / Ram Truck, visit www.tucker-hibbert.com.